I had already decided to do a bookstore. Part of this reason was that it is Sunday and libraries weren't open. And since I work nights, it was difficult to get a chance to go to a bookstore (I didn't manage it and wasn't sure what I would take a picture of if I had). In my area there aren't tons of bookstores. The closest to me is Barnes and Noble, which I do frequent. There are a couple of Tattered Cover shops, which are great shops, but definitely out of my way. 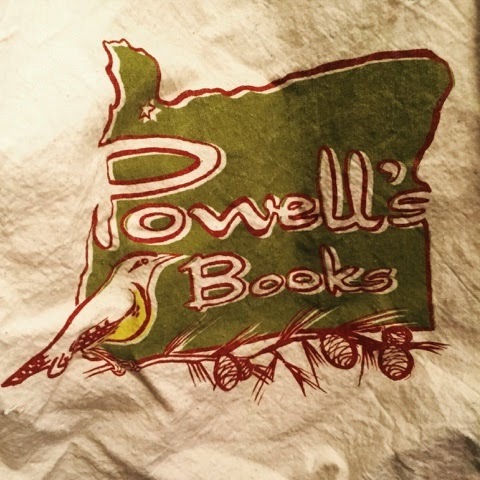 My very favorite bookstore was the famous Powell's in Portland, Oregon, which I visited a few years back. It is amazingly huge! A book lover's dream! There was also a nice large book shop in Eugene, Oregon that I visited last year and loved, but I can't remember what it is called. Since I live in Colorado and can't simply go over for a visit, I wasn't sure what to do. Then I remembered that I had merchandise from Powell's! So here is my Powell's tote bag! A good friend of mine also got me a pint glass from Powell's. I couldn't find a good way to get a picture of it with the bag, so I went with the bag by itself. If anyone goes to Portland, I highly recommend visiting this shop!